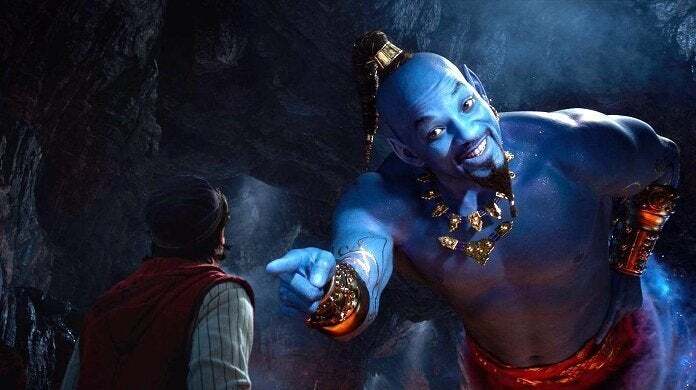 The latest trailer for Disney's live-action remake of the animated classic Aladdin finally offered fans their first look at Will Smith's take on the Genie. There might be some aesthetic similarities between Williams and Will Smith 's take on the character, but that's where the comparisons end. Director Guy Ritchie explained that the role is reliant on the actor, and that Genie is a larger-than-life take on their personality. “The great thing about the role of the Genie is that it’s essentially a hyperbole for who that individual actor is, so it’s a wonderful platform and tapestry for an actor to fill his boots on,” Ritchie told Entertainment Weekly. Smith himself recognized the challenge of taking on the role of Genie in the wake of Williams, who was a major draw for the original film. “Whenever you’re doing things that are iconic, it’s always terrifying,” Smith said. “The question is always: Where was there meat left on the bone? Robin didn’t leave a lot of meat on the bone with the character... [He] infused the character with a timeless version of himself. I started to feel confident that I could deliver something that was an homage to Robin Williams but was musically different. "Just the flavor of the character would be different enough and unique enough that it would be in a different lane, versus trying to compete... I think it’ll stand out as unique even in the Disney world. There hasn’t been a lot of that hip-hop flavor in Disney history," Smith added. It remains to be seen how fans will react to the new Genie, especially after the response to this first trailer. But we'll all get the full picture this summer, when Aladdin premieres in theaters on May 24th.